It has been quite a while since I posted an update, mostly because this time of year is insanely busy for me. I also have had a couple of weekends away, one of which was a quick trip to visit Montreal while my brother Tony was in town from Scotland. Tony and I have been working on an article together for Notre Dame Magazine on the relationship between religious faith and fantasy literature, and one of the highlights from the weekend was sitting in a brewpub for lunch in the old city while Tony outlined the remainder of the work we had to do on the back of a placemat. After we had our lunch, we wandered off down the main thoroughfare in search of something to see, and Tony suggested we try a museum that was dedicated to the life of Sister Marguerite Bourgeoys. The museum description promised a tour of her chapel, a view of the old city from a tower, and an underground excavation site of a 17th-century chapel, so I said sure. It turned out to be a fascinating place, in part because of the fascinating woman to whom it was dedicated. 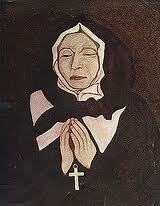 Sr. Bourgeoys was a French nun who came to Montreal from France in the middle of the 17th century. There she founded a small religious order—the first religious order to be founded in North America—and built a chapel and housing to help educate local young women. Unlike many schools and religious orders at that time, hers required no money or family connections to enter; her convent and school were open to all, rich and poor, French and native. She served as the Superior of her community for many years, until her retirement in 1693; she died in 1700, at the age of eighty. The museum fulfilled its promises, offering a nice view of the old city and a beautifully restored chapel. Beneath the grounds we were treated to a semi-private tour of an excavation site where the walls of the original 17th-century chapel stood next to two-thousand year-old artifacts from native Americans. In the gift shop I bought a short history of Bourgeoys's life, and have been reading it over the past couple of weeks. She was canonized by Pope John Paul II in 1982, making her the first female Canadian saint. I find her both inspiring and a little strange. Her complete dedication to the cause to which she committed herself, despite many hardships, is almost miraculous. She was so convinced that God would provide her that she gave away her inheritance, often traveled with no money or provisions, and lived with constant hope in the face of many setbacks, including the burning of her original chapel and house. But she was also one of these religious people who mistrusted any earthly pleasures, and who practiced self-mortification in a frequent, informal way. On one of her trips back and forth from France, for example, she slept on a bed of coiled ropes for the journey of several weeks.